The Sarah Phillips story fascinated me. I’ve never before seen anything like it. Tuesday, Deadspin broke a story that ESPN’s young columnist may be behind several internet scams amidst other incredibly mysterious activity. Almost immediately, ESPN terminated its relationship with the columnist that rose from message boards on a gambling site to writing for the biggest sports network in the world. The activity surrounding Phillips is like the Wild West of the internet with a few people telling stories of also being conned by Phillips. But then, the story got much weirder… and much more interesting. First, 9 and GirlsGoneKyle are connected. 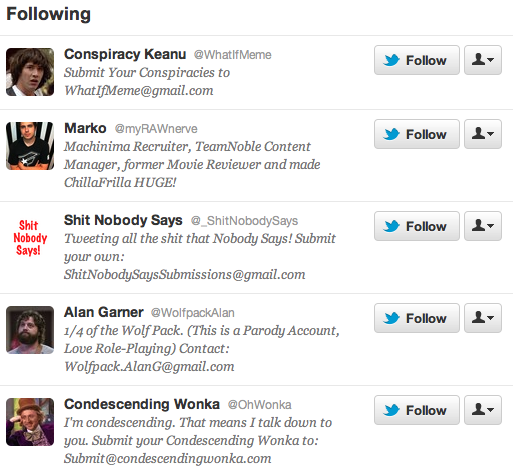 Both claim some ownership of the Wonka and Wolfpack parody accounts. The relationship between the two is seen in this tweet from April 8th. Both appear to be entrepreneurs of some kind with a focus on parody Twitter accounts. Both Facebook pages for @9 and @GirlsGoneKyle speak of making money and business. Interestingly, Cameron liked NBA Memes, the Facebook site in question through the original Deadspin article, on Sunday. So how does Sarah Phillips fit in to this empire of parody Twitter accounts? On April 29th, @GirlsGoneKyle tweeted that he had given up the @OhWonka account, which now becomes the key to the story. Yes, a fake Willy Wonka account is the key cog in a story about a fired ESPN columnist. Welcome to 2012. 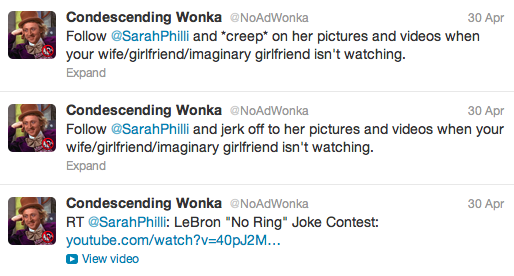 The next day, on April 30th, the @OhWonka account began mysteriously pumping the Sarah Phillips Twitter account relentlessly. The tweets have since been deleted, but were preserved by another Wonka parody account, @NoAdWonka, which copied the tweets from @OhWonka. We’re into second layers of Willy Wonka parody accounts. This is Inception level intrigue. Those preserved tweets show no less than 12 mentions of Phillips since April 29th, the day when Kyle Cameron said he no longer owned @OhWonka. The middle tweet was preserved thanks to one of our followers using TMI.me to retweet what had been sent to us by GirlsGoneKyle. All tweets from GirlsGoneKyle to Awful Announcing have since been deleted by Cameron and are saved via these screengrabs. I’m no legal expert, but surely the idea of giving Phillips and her group of people a fake contract for equity in a fake company is something that raises eyebrows. @NotBranden also tells Deadspin he has a role in the Sarah Phillips saga and is coincidentally the man behind another huge parody account, @YourFavWhiteGuy, with over 300k followers. 1) Sarah Phillips was fired from ESPN for her questionable behavior and being at the center of several internet scams and questionable dealings. She, and possibly multiple people on her behalf are involved. 2) One of those questionable dealings involved a hugely popular fake Willy Wonka Twitter page, which itself was part of a larger empire of parody accounts on Twitter. 3) The Wonka page appears to have come into Phillips’ possession on April 29th and was reclaimed by @9, @GirlsGoneKyle, and @NotBranden on May 2nd. 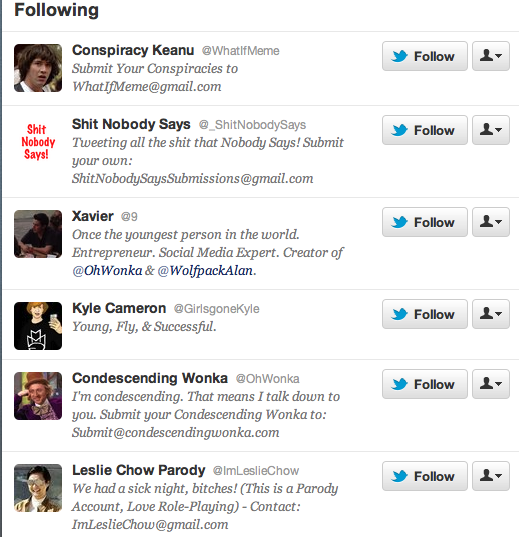 4) Most all of the major parody accounts on Twitter are somehow related to one another. 5) The mystery of Sarah Phillips is just starting to unravel. Again, another example where Phillips and her partner used her association with ESPN to try to get pepole involved in the questionable sport/comedy venture. We’ve also learned that Phillips and Prasad were apparently high school classmates. We’ll provide more relevant updates if they become available.